I tend to be a paper hoarder. I've had the Natural Composition Specialty Paper which by the way is gorgeous, and have not used it until now. I decided it was time to open it! This paper has a glossy, raised pattern printed on heavy-weight paper. There are 6 designs to choose from. I thought the music notes was nice to use for Christmas. I used the Ornaments Keepsakes Bundle again as well as the Festive paper-Piercing Pack. 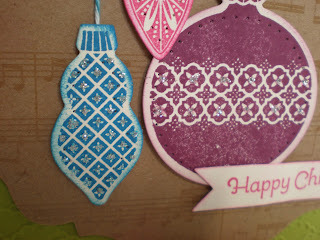 What do you think of the colors of the ornaments? Rich Razzleberry, Pacific Point, Melon Mambo and Lucky Limeade. Let me know what you think! 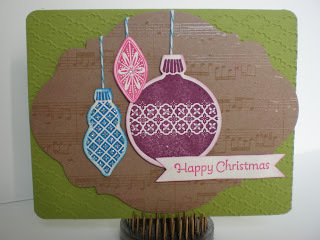 To add a little glimmer, I used Silver Sparkle Dazzling Details - which looks spectacular in person! Love your sparkly ornaments! 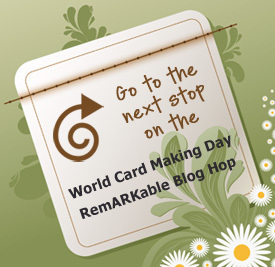 It was a fun blog hop. Thanks for participating!